I am using software called NVivo. Essentially, I use it to organize and summarize qualitative data. One cool feature is the ability to create a word cloud. I am experimenting with that feature and using the image facility on my laptop. I summarized some World Cafe events we held in February and March. The results were simply outstanding. The only fly in the ointment was I had to scan the picture and lost the colour. The overarching question we created our conversation around was: “What engages us in learning? Think of a time that you feel was a high point in your learning. This would have been a time you felt most alive, effective, and engaged in the learning process. Describe how you felt. What made this possible? What encourages us to continue learning and see learning as important in our lives? Questions emerged. I thought the most interesting was an absence in the data. What about teacher expertise in subject area or technical knowledge? It could be these are unstated but assumed necessary. Or it could be that the relational aspect, the art of teaching, is so important to this group of people the technical and subject knowledge is secondary. What do others think about this? Posted in Community, Education, Progressive Education, World Cafe Events and tagged community, education, Educational Leadership, eloquent questions, Progressive Education, teacher as transformer, transformative education. Bookmark the permalink. What did the World Cafe events reveal? The concept of community, in some form, was the most repeated quality of what engaged people in their learning. 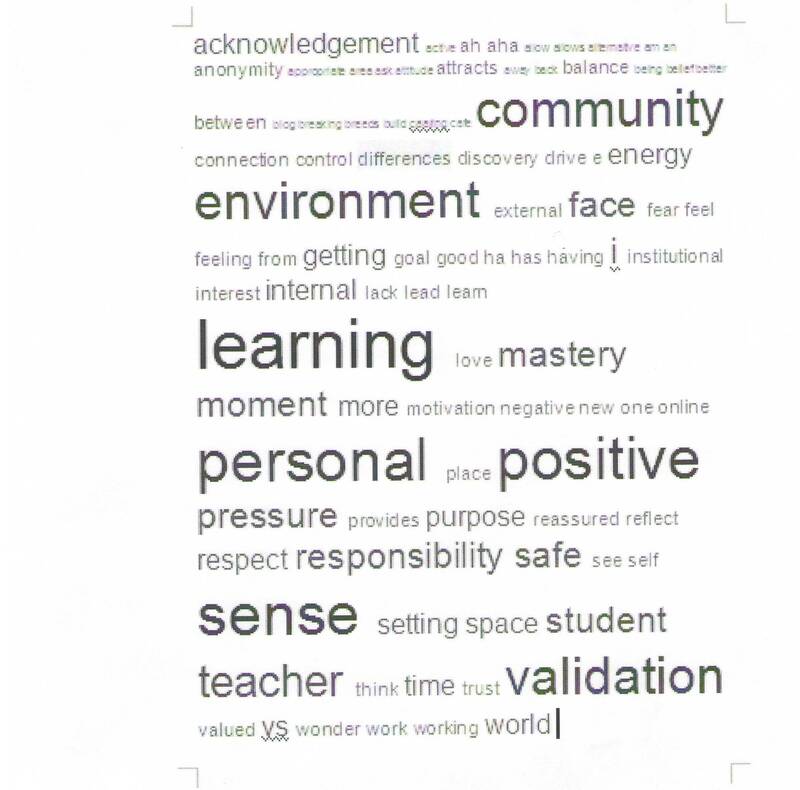 There were many descriptors for a community of learning. One that stood out was the community of learning being safe. Safe learners feel comfortable stepping out of their comfort zone and stretching to learn. This could be called the “Goldilocks Paradigm.” Learning is not too hard causing arresting stress; not too easy allowing boredom to prevail; just right, adding to the edges of knowledge the student possesses. One discussion led to an interesting revelation about the use of technology and what it contributes to a safe learning experience. As a strategy, it might be better suited for older students, but has potential across a range of ages and abilities from upper elementary and beyond. Video and audio files allow for use of pause and rewind, reinforcement of key concepts, time for mindful reflection and response, and opportunities for anonymous questions. The group was clear this should not replace the face-to-face interactions vital to learning, but could provide opportunities for interactions to develop in addition to the teacher-student relationship, such as valuable peer-to-peer connections. In an increasingly digital world, students and teachers can support each others learning outside the existing temporal and spatial restrictions associated with school as a building to attend on school days. School becomes more than a space and the online capacity expands the potential rather than diminishing it. Physical attendance coupled with other points of contact i.e. blogs, online forums, and video formats provide exciting potential for what a safe learning community can mean. The conversation about community, learning, and the role of multiple points of contact in the learning community resonated with my own learning experiences. I use a variety of digital formats in my learning at Gonzaga i.e. electronic blackboard, wikis, and blogs. They reveal the reality that learning is not place- or time-focused. It is ongoing with multiple points of contact essential to the shifting landscape of what school is and can become. The Khan Academy is a useful Math resource for some students and Selman Khan, its designer, has employed self-directed learning features by Selman Khan in the design of this site. He makes use of the advantages discussed in our group-connections, time for reflection, and anonymity, and makes learning safe..
Posted in Community, Leadership, Progressive Education, World Cafe Events and tagged community, education, Khan Academy, learning community, mindfulness, teacher as transformer, world cafe. Bookmark the permalink. 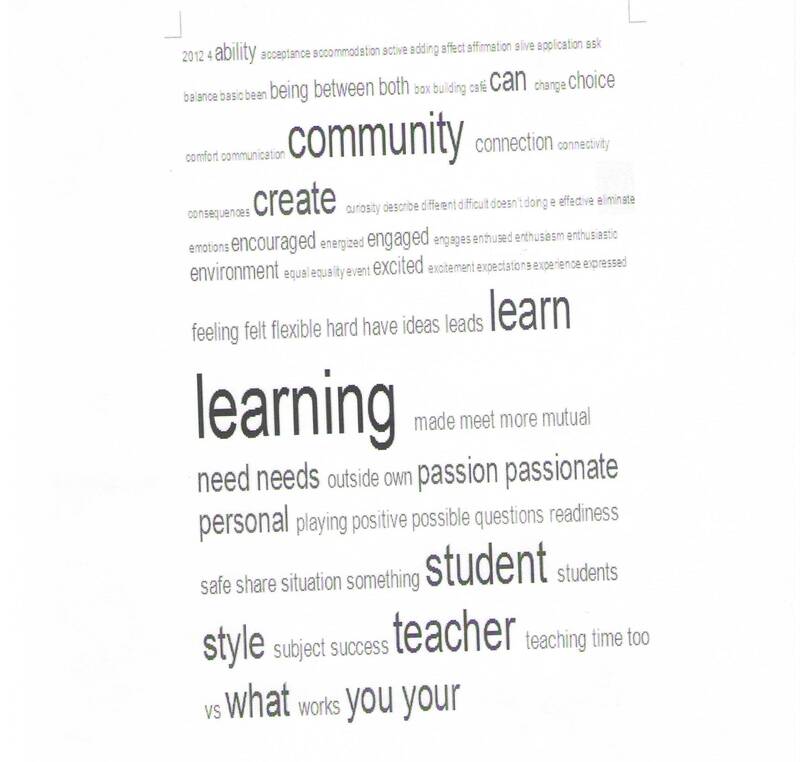 Several themes emerged in the World Cafe conversations about learning and an important one was community. The group used various connotations for community and qualities to describe community, but this theme resonated throughout the mindful and reflective conversations. The concept of team often served as a corollary for community. Teams strive towards common goals in sports, business, or education. A component of successful teams is ‘shared vision.’ Rather than leadership being vested in a person or a small group of people in a hierarchical structure, successful teams have the anchor of a vision and share the values that support the vision. A critical first question in a learning environment would be “What vision and values energize learning?” The common goal and energy bring to life the acronym: Together Everyone Achieves More [TEAM]! Humans share. It reveals who we are and what is important to us individually and allowing us to connect to the collective. We are affirmed as others listen. 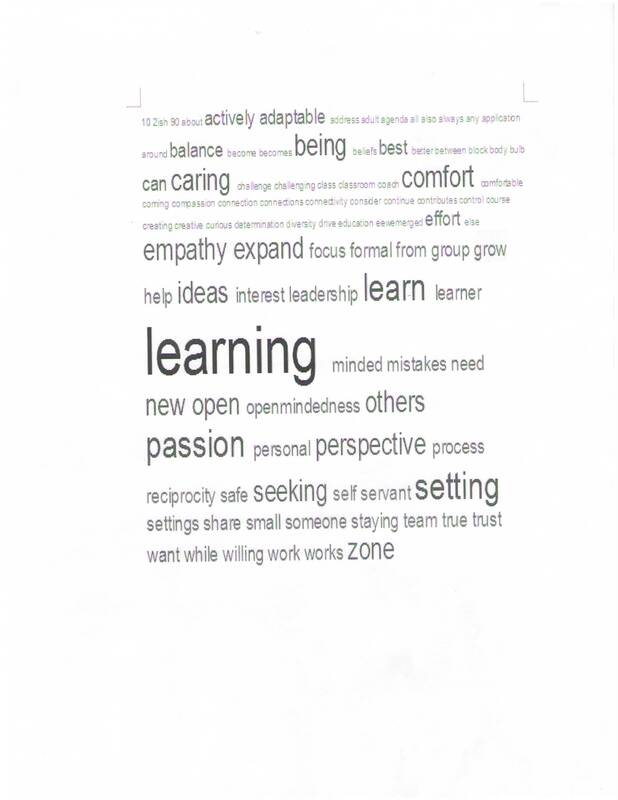 The World Cafe group suggested sharing was central to learning by revealing what is important and what is learned. The sharing may reveal gaps in learning or reveal more than one way to solve a problem and learn. Sharing in a safe environment, or community, focuses learning past the expert knowledge of one person, the teacher, and shifts it to the broader collective. Risks are more readily undertaken because there is support, and everyone can both teach and learn. We live in an increasingly complex world where the paradox of teacher and learner calls strongly for sharing. The idea of connectivity arose several times. A complexity of today’s world is a burgeoning need to connect with others in both new and traditional ways. We face paradox as we seek community. Community is no longer defined solely by where we live, as in a digital world, connections are made across the globe and communities shaped in radical ways. This encourages different and emerging views of community: where we live, where we work, and, how we connect. Community suggests paradox. The World Cafe group felt being face-to-face with others was essential at times, but suggested face-to-face might include digital platforms such as video conferencing or Skype. A benefit of on-line instruction is the ability to pause a video or audio file, reflect on material, take notes, and return to earlier points in the file. We cannot pause teachers in real-time to repeat exactly what was said, but we can in the digital world. Wise, prudent, and mindful use of technology serves learning if safely implemented. How do we use technology in traditional classrooms? What role can it or should it play in moving learning beyond the walls of the traditional and sometimes outmoded classroom? Healthy, vibrant, and safe communities give time and space for solitude. A common criticism of school and classroom scheduling is the lack of reflection time for teachers and students. Busyness is the order of the day in schools and classrooms. Time is necessary for learners to process the reams of available information to connect it to subject matter and make it meaningful. We observed this in the four World Cafe sessions; there were times when the room was quiet, as people processed and reflected on the questions or comments. Community brings us together and, at the same time, paradoxically allows personal space and time. Posted in Progressive Education, World Cafe Events and tagged community, education, Educational Leadership, Progressive Education, teacher as transformer, transformative education, world cafe. Bookmark the permalink. Community has been a recurring theme throughout the World Café conversations and events, with many descriptors alluding to communal practices and relationships needed for learning to happen. Reciprocity, connection, supportive, affirmation, and other words expressing interactions suggest community. The summary posters of the March 17, 2012 World Café Event confirmed this recurring theme of community and the table posters, to being posted, also bear this out. The theme of community is important not just in learning, but in life itself. Without community, can life and learning be as meaningful? The servant-leadership conference I attend in Portland reinforced that, although community continually evolves, as a value it can remain intact. Here are some examples. We easily dismiss these references to community as the extreme and needed actions and words of those in different settings. After all, Dr. King led the Civil Rights movement in its halcyon days and paid the ultimate sacrifice. Dr. Frankl survived the atrocities of concentration camps during World War II. What do their experiences have to do with simply getting through the day? Kirk Young, a colleague from Gonzaga, elaborated on what could be understood as community in the form of a value. The communities we choose to belong to share one common ingredient: intimacy. Ferdinand Tonnies, a German sociologist, used the word gemeinschaft and described this form of community as “a tighter and more cohesive social entity. [It is] exemplified in family and kinship” suggesting when humans gather in community, intimate experiences are shared. Members share the good, the bad, and grow together towards common purposes, thus are mission driven. Values and mission serve as glue for community. Father John Dear, a Jesuit priest, proposed in The Rebel Jesus, a second, mostly unnoticed miracle occurred during the Sermon on the Mount: the forming of community. Community allowed people to see the human nature of each other as Jesus instructed those closest to him to organize the large group (some believe well over 5,000 people) into small, more intimate groupings of about 50 people. Father Dear suggested that in these small communities, people interacted differently and shared as they made connections with those now close to them. People were no longer strangers; because moments before they were simply part of a large and increasingly hungry throng. In contemporary parlance, they were statistics. By witnessing the humanity in each other, we form community and share intimacy without fear. Our humanity is the one thing we share with others and through it, we find purpose to gather and create community around the universality of human values and the value of humans. Posted in Community, Leadership, World Cafe Events and tagged beloved community, leadership, Parker Palmer, servant-leadership, teacher as transformer, Viktor Frankl, world cafe. Bookmark the permalink.